As the frontman for JUDAS RPIEST, Rob Halford became one of the defining voices of heavy metal, but the powerhouse singer also has released a variety of interesting albums outside of his famous band. Now, a new box set called The Complete Albums Collection gathers together 12 albums that the Metal God issued with his solo band and various side projects. IT is scheduled to hit stores May 19th. Rob began his solo career in 1992 when he left JUDAS PRIEST and formed the thrash-metal outfit FIGHT. The box set contains that group’s three studio albums, as well as K5: The War Of Words Demos, a collection of 1992 recordings first released in 2007. After FIGHT, Halford formed the short-lived industrial-metal band 2WO, which also featured current Rob Zombie guitarist John 5. The band’s sole studio effort, 1998’s Voyeurs, also is included in The Complete Albums Collection. 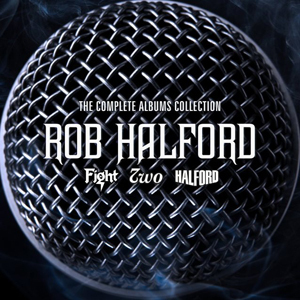 Rounding out the box set are seven albums by the band HALFORD, which marked Rob’s return to traditional metal. These include four studio albums — 2000’s Resurrection, 2002’s Crucible, 2009’s Halford III: Winter Songs and 2010’s Halford IV: Made Of Metal — as well as three live albums, two of which are two-CD sets. Rob returned to JUDAS PRIEST in 2004, and his main musical focus since then has been the influential U.K. band, but The Complete Albums Collection show just how expansive the singer’s talents are.